Driving these days is a pricey affair indeed. Our colleague Simon saw a car advertised for ?1500 the other day. On enquiring further he was told 'the car's only worth ?500 - but it comes with a full tank of petrol.' Sigh. So we at gadgetshop HQ have coined a solution. Forget pricey car parts - build your own. The engine you build is a greatly simplified version of a real car engine. 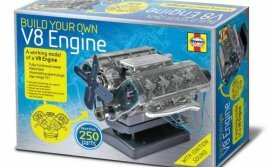 The model is designed to be fun to put together, and to make it easier for you to understand how a full-size four-stroke car engine works. This box contains all the parts and tools you need to assemble the working model. It comes complete with its very own Haynes Manual giving you clear step-by-step instructions to guide you through the build process, all you need to provide is the time, two batteries and a little vegetable oil. The on/off controller also includes a sound chip which reproduces the noise of an engine starting, as the model begins to work. What a beauty.